Introduction: The control of pain associated with root canal treatment (RCT) is crucially important in endodontics. The aim of the present study was to compare the effect of using articaine versus lidocaine local anesthetics for inferior alveolar nerve block (IANB) on pain after RCT. Materials and Methods: Eighty-eight patients diagnosed with symptomatic irreversible pulpitis of a mandibular first molar were selected. The patients randomly received either a cartridge of lidocaine or articaine using IANB. RCT was initiated 15 min after the injection. Lip numbness was a requisite for all the patients. The post-operative pain was assessed by using 170-mm visual analog scale at 0, 2, 4, 6, 12, 18, 36, and 48 h after the treatment. The data were analyzed by SPSS 22 statistical software. Results: The mean total post-treatment pain in the lidocaine group was 37.1 ± 32.9 whereas it was 25.4 ± 26.4 for articaine group (P < 0.001). Pain at 4, 6, 12, 18, and 24 h after the RCT in articaine group was significantly less than the lidocaine group (P < 0.001). Conclusion: Using articaine for IANB may increase post-RCT comfort than lidocaine. Further study is needed to confirm the results. The most frequent pains of the maxillofacial region are the pains of the inflammatory pulp or periapical diseases. The control of the pain in dentistry and especially in endodontics is of great importance., The frequency of the occurrence of pain in patients who underwent root canal treatment (RCT) has been reported to be about 40%, suggesting the need to prevent these pains. The factors that are important in the occurrence of RCT-related pains are as follows: patient’s age, gender, and tooth type; presence of the preoperative pains; immunologic, psychological, and microbial factors; and also chemical mediators. Lidocaine is the gold standard anesthetic agent. It is an amide anesthetic with a short onset of action and an intermediate duration of anesthesia when associated with epinephrine. Articaine with a heterocyclic thiophene ring has been demonstrated to achieve higher success levels than lidocaine for infiltration anesthesia in the permanent mandibular molars. Clinical advantages of articaine include the duration of its anesthetic effect and its superior diffusion through bony tissue. On the contrary, there is no comparison between articaine and lidocaine in terms of their effects on the root canal post-treatment pains. Therefore, the current trial was undertaken to compare the effect of using articaine versus lidocaine local anesthetics for inferior alveolar nerve block (IANB) on pain after RCT. In this prospective double-blind clinical trial study, the number of the teeth was calculated 44 for each group (totally 88 teeth) on a power estimation of 80% to detect a difference of 15 between the mean pain scores of two groups at α = 0.05. Therefore, 88 mandibular first molars with the irreversible pulpitis were selected from the patients referring to the Department of Endodontics, Isfahan University of Medical Sciences (IUMS), Isfahan, Iran, and were randomly assigned to the studied groups. Regional Bioethics Committee affiliated to IUMS approved the study design and protocol (#290250). Written informed consent was taken from each patient. The criteria for the diagnosis of the irreversible pulpitis were spontaneous pain and severe or longer sensitivity to the cold test. The selected patients showed no drug interference or any systemic disease. Exclusion criteria were as follows: pregnancy, intake of medicines other than contraceptives, history of allergy to the components of the local anesthetic solutions, local anesthesia in the area at least 1 week before the experiment, periodontal disease, or a history of trauma or sensitivity in the teeth. The patients received either a cartridge of lidocaine 2% with 1:100,000 epinephrine (Lignospan; Septodont, Saint Maur des Fosses, France) or a cartridge of articaine 4% with 1:100,000 epinephrine (Septocaine; Septodont) using IANB. All cartridges had been masked with the opaque labels and the cartridge caps and the rubber plungers with a black felt-tip marker under the sterile conditions. The cartridges received a code not known to the operator who performed the injections. All injections were performed by one operator. Lip numbness was a requisite for all the patients to initiate the treatment. The patient was asked for lip numbness 15 min after the injection. If profound lip numbness was not achieved, IANB was indicated as missed, and the patient was excluded from the study. One patient in the lidocaine group and three patients in the articaine group were excluded from the study as a result of a lack of profound lip numbness and replaced with other patients. After 15 min, access cavity was prepared, rubber dam was placed, and the root canal was instrumented using the crown-down technique. RCT was completed using lateral condensation of Gutta-percha and AH26 sealer (Dentsply, Detray, Germany) in a single appointment. The patients who felt pain during the treatment and needed supplemental anesthesia were also excluded from the study and replaced with other patients. Before the injections, the patients received complete information regarding visual analog scale (VAS). In this study, a Heft-Parker VAS, a straight line of 170 mm, was used. The patients were asked to record the VAS scale at the point that best described their pain levels at 0, 2, 4, 6, 12, 18, 36, and 48 h. Patients were advised to use ibuprofen (400 mg) (Darou Pezeshk, Tehran, Iran) if experiencing pain informing the researchers. Data were considered as mean (standard deviation) and analyzed by SPSS 22 (IBM Corp, Armonk, NY) using repeated measurement ANOVA and Mann–Whitney U-tests. 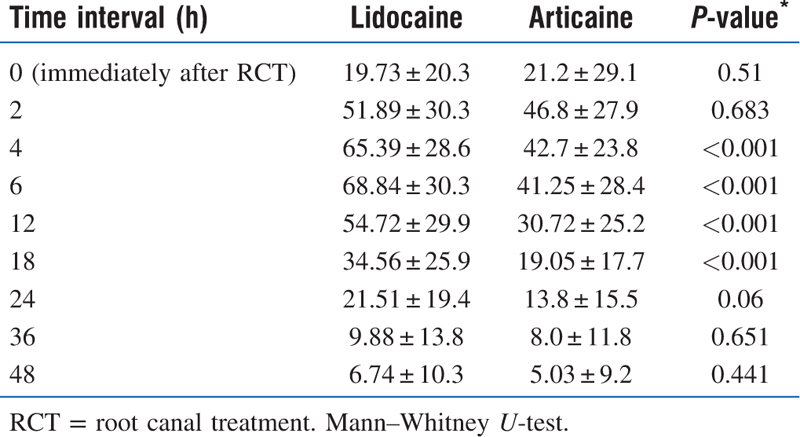 The mean total post-operative pain in patients anesthetized by lidocaine 2% was 37.1 ± 32.9 whereas it was 25.4 ± 26.4 for articaine 4% (P < 0.001). There were no significant differences between the two groups at 2, 36, and 48 h post-treatment time intervals (P = 0.683, 0.651, 0.441, respectively). On 4, 6, 12, 18, and 24 h after the RCTs, patients in articaine group experienced lower subjective pains than lidocaine (P < 0.001) [Table 1]. In lidocaine and articaine groups, 14 (31.8%) and 7 (15.9%) of patients, respectively, used ibuprofen (400 mg) (Darou Pezeshk). Individuals who received lidocaine anesthetic solution recorded higher VAS scores than articaine group except to the immediately after the RCTs in which articaine group experienced higher pain ratings. This finding suggested that articaine anesthetic solution achieved higher success rates than lidocaine to control post-operative RCT pain. Furthermore, in total, the mean pain ratings were higher in lidocaine than articaine group. As the pretreatment VAS pain scores of patients in both the anesthetic groups were similar, the reported results can be related to the anesthetic solution efficacy to control the pain. The study participants also were of different age groups, therefore, the results can be applied for children or elderly. Furthermore, due to the lack of any significant effect of gender and age on the VAS pain scores, any possible effects of these parameters can be very small or even ignored. The long-lasting effect of an anesthetic relates to its degree of protein binding as well as injection site or concentration of the vasoconstrictor present in the anesthetic solution. Articaine has significantly higher protein-binding percentages than all amide local anesthetics only similar to the ultra-long action materials like bupivacaine, ropivacaine, and etidocaine. This property is associated with a longer duration of the anesthetic effect. In the present study, no significant differences were found between patients anesthetized by articaine and lidocaine at 2, 36, and 48 h post-operative time intervals. However, the VAS scores were significantly different on other time intervals. Batista da Silva et al. showed no significant differences between articaine and lidocaine in relation to the post-operative pain for incisive/mental nerve block resembling our findings. Kung et al. in their meta-analysis study reported that there is an advantage using articaine over lidocaine for supplementary infiltration after mandibular block anesthesia but no advantage when used for mandibular block anesthesia alone or maxillary infiltration. Tortamano et al. reported higher success rate with articaine solution than the lidocaine agents, although there were no significant differences in patients with irreversible pulpitis. One study used classified ratings of VAS scores as mild, moderate, and severe which seems not to make a distinction between close VAS scores. For this reason, we did not base our statistical analyses on the categorized VAS scores in the present study; however, we reported the frequency of different classified pain severity for both the groups. Within the limitations of this study, it was concluded that using articaine for IANB may increase post-RCT comfort than lidocaine. Further study is needed to confirm the results. Saber Khazaei has editorial involvement with Dent Hypotheses. Sharifi R, Nazari H, Bolourchi P, Khazaei S, Parirokh M. The most painful site of maxillary anterior infiltrations. Dent Res J 2016;13:539-43. Saatchi M, Shafiee M, Khademi A, Memarzadeh B. Anesthetic efficacy of Gow-Gates nerve block, inferior alveolar nerve block, and their combination in mandibular molars with symptomatic irreversible pulpitis: A prospective, randomized clinical trial. J Endod 2018;44:384-8. Ng YL, Glennon JP, Setchell DJ, Gulabivala K. Prevalence of and factors affecting post-obturation pain in patients undergoing root canal treatment. Int Endod J 2004;37:381-91. Segura-Egea JJ, Cisneros-Cabello R, Llamas-Carreras JM, Velasco-Ortega E. Pain associated with root canal treatment. Int Endod J 2009;42:614-20. Arias A, Azabal M, Hidalgo JJ, de la Macorra JC. Relationship between postendodontic pain, tooth diagnostic factors, and apical patency. J Endod 2009;35:189-92. Oshima K, Ishii T, Ogura Y, Aoyama Y, Katsuumi I. Clinical investigation of patients who develop neuropathic tooth pain after endodontic procedures. J Endod 2009;35:958-61. Seltzer S, Naidorf IJ. Flare-ups in endodontics: I. Etiological factors 1985. J Endod 2004;30:476-81; discussion 5. Bartlett G, Mansoor J. Articaine buccal infiltration vs lidocaine inferior dental block—A review of the literature. Br Dent J 2016;220:117-20. Venkatachalam D, Chambers JP, Kongara K, Singh P. Pharmacokinetics of articaine hydrochloride and its metabolite articainic acid after subcutaneous administration in red deer (Cervus elaphus). N Z Vet J 2018;66:16-20. Sakhaeimanesh V, Khazaei S, Kaviani N, Saatchi M, Shafiei M, Khademi A. Anesthetic efficacy of articaine and ketamine for inferior alveolar nerve block in symptomatic irreversible pulpitis: A prospective randomized double-blind study. Iran Endod J 2017;12:449-53. Sierra Rebolledo A, Delgado Molina E, Berini Aytis L, Gay Escoda C. Comparative study of the anesthetic efficacy of 4% articaine versus 2% lidocaine in inferior alveolar nerve block during surgical extraction of impacted lower third molars. Med Oral Patol Oral Cir Bucal 2007;12:E139-44. Vree TB, Gielen MJ. Clinical pharmacology and the use of articaine for local and regional anaesthesia. Best Pract Res Clin Anaesthesiol 2005;19:293-308. Batista da Silva C, Berto LA, Volpato MC, Ramacciato JC, Motta RH, Ranali J et al. Anesthetic efficacy of articaine and lidocaine for incisive/mental nerve block. J Endod 2010;36:438-41. Paxton K, Thome DE. Efficacy of articaine formulations: Quantitative reviews. Dent Clin North Am 2010;54:643-53. Smith T, Urquiola R, Oueis H, Stenger J. Comparison of articaine and lidocaine in the pediatric population. J Mich Dent Assoc 2014;96:34-7. Kung J, McDonagh M, Sedgley CM. Does articaine provide an advantage over lidocaine in patients with symptomatic irreversible pulpitis? A systematic review and meta-analysis. J Endod 2015;41:1784-94. Mikesell P, Nusstein J, Reader A, Beck M, Weaver J. A comparison of articaine and lidocaine for inferior alveolar nerve blocks. J Endod 2005;31:265-70. Potocnik I, Bajrovic F. Failure of inferior alveolar nerve block in endodontics. Endod Dent Traumatol 1999;15:247-51. Nizharadze N, Mamaladze M, Chipashvili N, Vadachkoria D. Articaine—The best choice of local anesthetic in contemporary dentistry. Georgian Med News 2011;190:15-23.